Casa Lala is the newly constructed vision conjured by designer Rela Gleason. 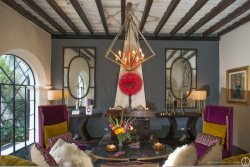 Reminiscent of early 20th century industrial architecture,loft like spaces with soaring beamed ceilings are crafted by local craftsmen in authentic Mexican tradition. Two outdoor salas with wood burning fireplaces and an argentine grill. There is a salon with grand piano overlooking the pool and spa. The kitchen is a cook's dream kitchen fully equipped with top notch appliances, pots pans, cooking utensils, etc. Truly inspiring space! There are three romantic bedroom suites each with its own fireplace and elegant bathrooms - stocked with plush towels and terry robes. The beds are dressed in pristine white hem stitched linens - this is five star living. 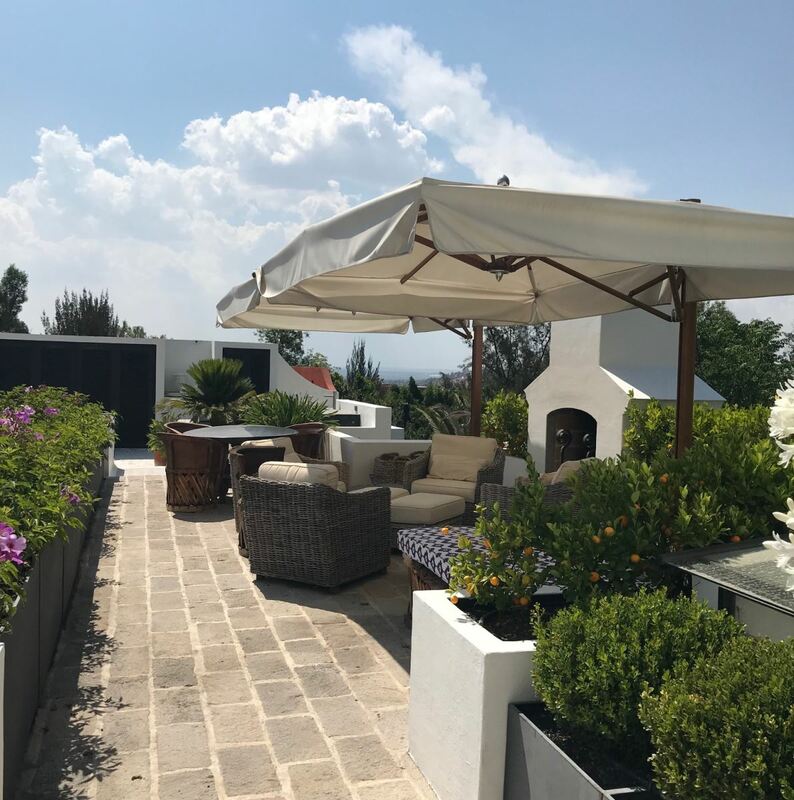 Glorious sunset views from the Roof terrace with wet bar and wood burning fireplace which overlooks gardens and views of the Parroquia and the city. Experience the ultimate San Miguel experience from the moment the house driver picks you up at the airport (Leon or Queretaro Only - Suburban) One airport service is included. We can arrange the other guests transportation, should you all have different arriving and departing flights. Full maid service Monday- Friday 9-3 and Saturday 9-12 (maid, cook, and gardner) and fabulous breakfasts Monday -Saturday, and a provisioned bar on arrival are included in the rate. Gas to heat the pool is at the client's expense - Please ask Premier about the cost for the week. House driver picks you up at the airport (Leon or Queretaro Only - Suburban) One airport service is included. Full maid service Monday- Friday 9-3 and Saturday 9-12 (maid, cook, and gardner ) and fabulous breakfasts Monday -Saturday, and a provisioned bar on arrival are included in the rate.